From the Editor. Nothing is more necessary in the church and its witness to the world than godly male leadership, including church officers, husbands, fathers, and any man in a position of influence. Nehemiah gives us a sterling example from God’s Word of what faithful leadership looks like. I explore the principles and examples we as men may glean from Nehemiah. Danny Olinger reviews the landmark publication of Geerhardus Vos’s Dogmatic Theology in “Vos the Systematician.” It may be news to some that Vos was a systematic theologian before he was a biblical theologian. He always saw these two disciplines as necessarily complimentary and not mutually exclusive. One cannot do without the other. This five-volume set is a theological treat no one should miss. There is no better way to learn to pray than to use the prayers of God’s Word. Candyce Magee reviews Gordon Keddie, Prayers of the Bible, a very useful daily devotional that stands out among the multitude of devotional options. 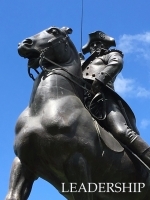 Cover picture: Statue of General John Stark, Stark Park, Manchester, New Hampshire. Gen. Stark won the Battle of Bennington (August 16, 1777) against all odds, which proved to be a turning point in the War for Independence. Doctrine in Development: Johannes Piscator and Debates over Christ’s Active Obedience, by Heber Carlos de Campos Jr.